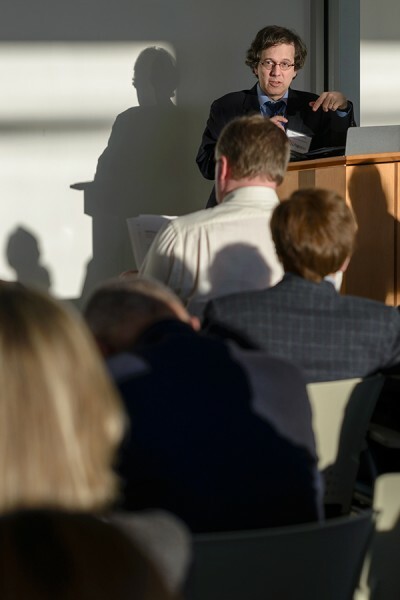 Stephen E. Kimmel, M.D., MSCE, professor with the University of Pennsylvania School of Medicine and principal investigator for the IGNITE coordinating center, addresses attendees in the UF Clinical and Translational Research Building as part of the January 2015 IGNITE network meeting. Just a few days prior to President Obama’s unveiling of the Precision Medicine Initiative, more than 60 experts from across the country assembled at the University of Florida to present and discuss their successes and challenges in developing methods for incorporating genomic information as a routine part of patient care in diverse clinical settings. The meeting on Jan. 27-28, 2015, was one of three meetings convened each year by the national Implementing Genomics in Practice (IGNITE) network, which launched in June 2013 and comprises six demonstration projects, a coordinating center, and numerous sites across the country. IGNITE is funded by the National Institutes of Health. “This meeting represents ongoing efforts by NIH and others to identify and document practice models, clinical decision support tools, and educational strategies that effectively incorporate genomic information into the patient care process on a large scale,” said Julie A. Johnson, Pharm.D., dean of the UF College of Pharmacy and director of the UF Health Personalized Medicine Program, which was developed within the UF Clinical and Translational Science Institute. IGNITE is building a unique learning community among organizations taking a comprehensive approach to genomic medicine, with the goal of serving as a national resource for developing and disseminating knowledge about solutions for genome medicine as they are tested and implemented in practice – from integrating genomic information into electronic health record systems to facilitate the development of point-of-care clinical decision support to creating resources and education programs for health professionals and patients. IGNITE projects are using genomic information to guide the prescription and management of specific medications, diagnosis and personalization of therapy for select types of diabetes, primary care strategies for hypertension-associated chronic kidney disease, and approaches to gathering and using family history data. Project sites are based at Duke University, Indiana University, Mount Sinai School of Medicine, University of Florida, University of Maryland, and Vanderbilt University, and the coordinating center is at the University of Pennsylvania. Attendees included researchers, program managers, clinical collaborators and NIH representatives, as well as trainees and students interested in genomic medicine. Dr. Kristin Weitzel, associate director of the UF Health Personalized Medicine Program, presented an overview of genomic medicine education programs underway at UF Health, and representatives from each IGNITE site presented project updates. The meeting also included guest presentations by other sites at varying stages of implementing genomic medicine projects, including Moffitt Cancer Center, Nemours Children’s Health System and the University of Illinois at Chicago. Attendees discussed topics including clinical evidence and utility, provider and payer adoption, clinical decision support, and pharmacogenetics. As one of the first sites funded in the IGNITE network, the UF Health Personalized Medicine Program is continuing to advance practice and education in pharmacogenomics and genomic medicine, with a new research initiative to explore the role of CYP2D6 enzyme testing in patients taking select opioids for pain management, expansion of existing clinical programs, and the launch of new educational courses that allow health science students and health care professionals to use their own genetic information as part of the learning process. These and similar efforts underway by IGNITE investigators and the national research community are helping to pave the way to move precision medicine from future possibility to an everyday reality in which differences in people’s genes, environments, and lifestyles are used to pinpoint optimal treatments for each individual. This NIH-funded, UF-led study showed that a genetic test can significantly reduce the risk of adverse cardiac events for heart stent patients by helping identify the best antiplatelet medication for each patient.